We dabble in the arts. 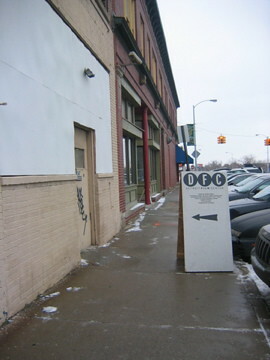 On Saturday mornings, I take a class at the Detroit Film Center. Like most things in life, it’s not the destination, it’s the journey. Let’s take a quick tour. 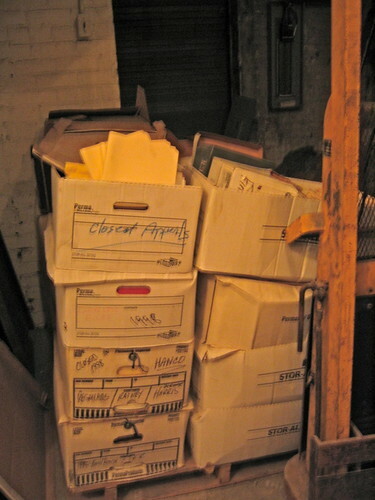 The one on top was labeled “closed appeals.” (Apparently there’s a lawyer’s office elsewhere in the building.) A shameless snoop, I plucked one out at random and started reading a very sad story about a man who loved marijuana more than paying child support. Drama is all around us; all we have to do is look. You’ll notice it starts to look significantly less grimy at this point. By the time you get to the top, it’s actually pretty nice, in a shoestring-budget, kindness-of-strangers, scrabblin’-for-grants kind of way. And the view is great. I’ll always remember this place as the first time I ever heard actors read lines I’d written. We had auditions for our group project this week, although “group project” probably makes a three-minute narrative film sound a little grand. Not film, video. But it has a story, and two actors, and two locations, and a script. Seven people answered our Craigslist ad, which promised only lunch in return for a day’s work. But this was the strange part — one couple presented themselves as a package deal, so we had them read together. They put a lot of energy into the lines, and it worked very well. Then the next guy came in, and played it just the opposite — very dry, very low-key, and it worked equally well. We cast the first couple, but told the other guy we wanted to keep him close, because the teacher wants the next class to write something specifically for him. (Just like in Hollywood, only with no money or recognition whatsoever.) On just these Saturdays, I’m getting a little of the newsroom back — that sense of collaboration and teamwork. Of course, production isn’t until this weekend. I may feel very differently after that. Flash fun to be found here. Load and wait two seconds for the fun to start. If anyone reads Dutch, let me know what it says. If you’re in a Super Tuesday state, tell us a little about E-Day where you are. An experience in collaborative citizen journalism, eh? Off to run six errands and make eight phone calls. Back eventually. Tuesday will indeed be super. I want a coconut. I mailed my vote in a week ago. I keep the ballot stub and post it outside my cube as my “License to Complain”. Whadda you mean you can’t read Hema’s cute web site? The ghetto blaster is right there, just next to the confetti which is next to the feestvlaggetjes which is just above the feestballonnen. No lines here in mid-suburban Connecticut. But lots of cars and people coming and going in the elementary school parking lot. My precinct showed 38 votes (800 voters in recent city council election) by 7:20 am. Zero campaign signage outside of school and no toadies passing out litature. Most candidates ignored Connecticut during this primary season as it is seen as a safe blue state. Only registered Republicans and Democrats are allowed to vote in Connecticut. Over 50% of all voters are listed as Independent. If registered as an Independent, you are allowed to change affiliation on the day of the primary, but I can’t see a lot of people willing to take the time to do this. I love going to auditions. It’s nerve-wracking but a thrill just the same. Wish I could do that stuff full time instead of what I do now. I got my sample ballot a few weeks ago and was looking at the polling address. It looked familiar. Turns out it is the address of somone we know: the family of the girl who used to rent next to us. The one who had the cops over her house about eight or nine times for violence, theft and other drug related fun activities. The girl and her new ex-con boyfriend now live with mom at this residence. Not a big deal, but the mom and us are not on the greatest terms because we had a few of heated discussions about the fact she thought we were making much ado about nothing. Despite all of the destruction of property, yelling and screaming and drunken brawls. “Hey, weren’t you young once.” Why, yes. Yes we were, but our neighbors didn’t have to have the police on speed dial. Interesting, Danny. I don’t even know if private homes can be used as polling places in Ohio, but most of the time people here vote in schools, churches, fire houses, court houses and township halls. I wonder how someone goes about getting his/her home designated a polling place. In California they put polls in people’s homes? I don’t know about polls, but I’ve heard they put poles in people’s homes in CA. I too was young once, but I never had a pole in my house. It would have been too hard to explain to Grandma. They do put polling places in homes in California. I remember voting for Clinton the first time in a house with a chicken coop in the back yard. In LA. What do you need translated from Dutch? The names of the items shown? My Dutch is very rusty but I can still read some. My polling place has changed a few times over the years. Last few elections were at a local school, but several people on my block have had their garages cleared out for voting. If it’s at a private residence, it has always been the garage with the door wide open. Never in the living area of the home. That would be odd. I’m not sure about the restrictions and regulations, but the Registrar of Voters accepts applications for this. Wow. I learned something new today. Thx. Holy Moly, Nancy, where are the building and fire inspectors? That building actually has permission for public occupancy? 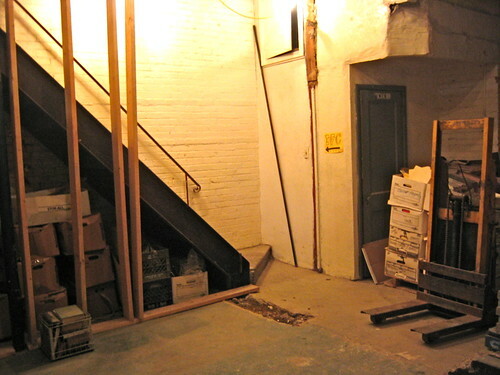 The one thing I took note of in the pictures was that first staircase. There is a handrail against the wall, but none on the outside to protect from a fall. I know in the D life is tough and this all adds to N Nall’s steet cred, but we get “safety” drilled into us a lot where I work. I want some of those feestvlaggetjes. They are so darn cute I’m sure they would perk up my life. Was that store a Danish competitor to IKEA? That’s the only place around here that sells such cool stuff. And we have to drive to Chicago. There’s no fun shopping here in the Fort. Whoops, wasn’t reading carefully! But we still don’t have anything like that within 100 miles. I’ve voted at people’s homes many times in California and as Danny says, it’s always been in the garage with the door(s) open. And the residents have no access to anything so, Danny, you can feel safe voting at your old antagonist’s place. You probably knew that. 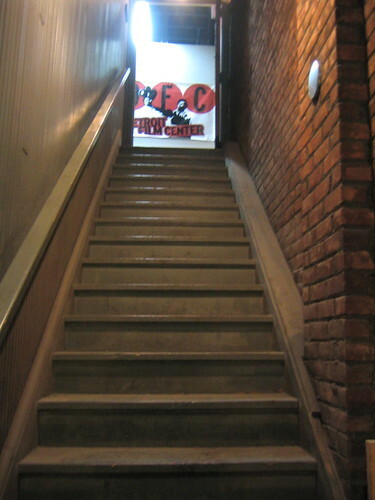 There’s no way that DFC stairway meets basic code or ADA requirements from any perspective: treads and risers, railings, lack of landings, nuttin. I can’t imagine an insurance company covering that death trap. I don’t see any picture or link to picture, but obviously the rest of you do. Gotta wonder. I believe some historic buildings can get exempted from some ADA requirements if they have alternative routes to the top, and there is a freight elevator. As for “death trap” — eh. Life is a terminal disease. As long as no one’s smoking and the wiring was installed by non-morons, I’ll take the risk. Yeah, we had a Super Tuesday, but since this is the biggest holiday of the year, you heathens can vote today — we moved the election to Saturday. Nancy, you mentioned that the wiring had to be installed by non-morons. Take a closer look at the chandelier. Ash, usually one would snidely comment “Hey, at least your priorities are straight,” but given the fiasco that continues in terms of the rebuilding effort and little support from the Feds, I’d say you DO have your priorities straight. On another note. Have any of you been following the story of these massive undersea internet transmission lines that are getting cut in the Middle East? Odd. I am typically not a conspiracy guy, but something doesn’t smell right here. It is probably just a coincidence, but I was also thinking about the elections today and all of the hub-bub in recent years about the (in)security of electronic voting and it just briefly crossed my mind that what if the two things were related. Not enough for a feature movie there, but maybe enough for part of a plot line on several episodes of 24. Oh, don’t get me wrong here, Nance. I’m not being censorious. I’ve certainly hung out in worse places. Still do. I was just observing. 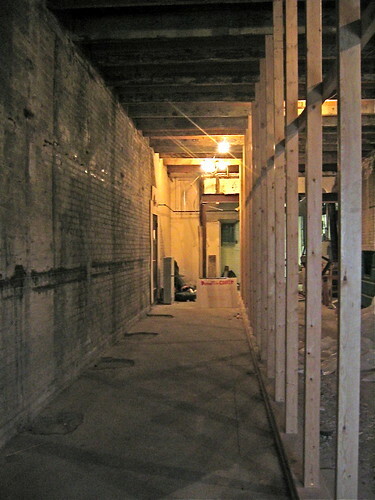 There are some exceptions in historic buildings for some ADA requirements. There are variables such as the bldg itself, its usage, the type of shortcoming and the degree of renovation that is being undertaken. I also have no idea what Michigan or Detroit or local county codes require. In my country, that stairway would need work. After today, both Senator Clinton’s and Obama’s realistic chances to win the nomination will STILL be alive, and this begins to raise the possibility of a really destructive primary battle…WJC has already shown his unflinching willingness to play that game…and indeed, 2008 is probably HRC’s only chance at the brass ring (especially if another Democrat wins the White House in 2008, tying up the D race for that place until 2016), whereas Obama almost certainly has at least one more major run at the White House in him, even if he has to wait all the way until 2016 and the end of a second HRC term in office. Coloradans are caucusing at 7 p.m. Mountain Time (The Time Zone That Time Forgot And Decades Cannot Improve) in homes, schools, etc. As a recovering newspaper journalist, I’m caucusing tonight for the first time since curiosity in ’92 led me around the block to an across-the-alley neighbor’s living-room meeting. Anyway, interest in Clinton-Obama is so high that the Denver Dems are predicting HALF the city’s 95,000 or so registered Democrats will attend their caucuses, something absolutely unheard of. Forrest Whittaker came to town the other day to help Obama-ites practice how to run and participate in their caucuses — and yeah, to sign a few autographers. The robo-calls from Obama (I’ve had a few the past week from both him and Hillary) list the starting time at 6:30 p.m. in anticipation of giant confuso-cluster-jams at the doors, since the caucuses close doors and start promptly at 7. Eastern Market is now headed by Dan Carmody, immediate past director of Fort Wayne’s Downtown Improvement District. ashley • MichaelG • John • Dorothy • Danny • Kirk • Jim in Fla • Laura • Jim in Fla • LAMary • Danny • Jim in Fla • Sue • Danny • Julie Robinson • LAMary • Julie Robinson • MichaelG • Connie • nancy • ashley • Sue • jcburns • Danny • MichaelG • brian stouder • paddyo' • Mitch Harper • and YOU.